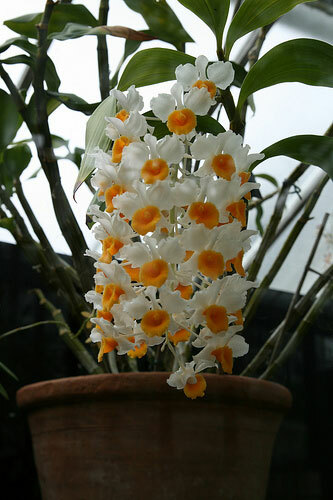 Dendrobium orchid care varies widely because it's such a diverse genus, with about 1200 species and lots more man-made hybrids, many of which require different conditions. Fortunately, most of them are easy to grow once you know what they need. Learn some of the commonalities here, then research your particular plant. These are one of the most popular types of orchids, and the ones you find at mass-market places like supermarkets tend to be well-suited to indoor orchid care in typical homes. Most of these plants like bright light, 2000-3000 footcandles, similar to Cattleya orchids. If there's sunburn or the leaves are turning red, give it less light. Otherwise, keep experimenting to find out how much more light it can tolerate. Give them as much light as they can handle. Temperature requirements vary widely. Plants sold at supermarkets and other mass-market places will tend to like intermediate temperatures, as they are chosen to do well in typical homes. But in general, you'll have to read up on your particular species. Most of these plants (but not all) like to dry out between waterings. If your plant drops all its leaves, it isn't dead! It's entered a dry rest, and proper after bloom care for this species means it shouldn't be watered until it starts growing again, except the bare minimum needed to keep the pseudobulbs from shriveling. This is a common adaptation in orchids from areas with a dry season. I don't think of these as being particularly picky about humidity, but provide about 70% humidity if you can. They like to be a bit underpotted, so that the roots fill the pot pretty densely. This can make them tip over easily, so clay orchid pots can help make tall plants more stable than lighter plastic pots would. Orchid potting mixes based on fir bark are most common. Show Me Your BEST Dendrobium Orchids! I want to see your favorite Dendrobiums! So do other people looking at the site, because there are so many kinds to learn about. So show off your best plants, say how you grew them, and brag a bit! Your description will appear on a Web page exactly the way you enter it here. You can wrap a word in square brackets to make it appear bold. For example [flower] would show as flower on the Web page containing your story. You can also use HTML for italics, <i>like this</i>. Click to see the rest of the form and complete your submission.